TheArmenianKitchen.com : Today's lesson is...Lentils! Lentils are legumes, meaning they come from a plant with double-seamed pods that contain a single row of seeds. Other common legumes include peas, peanuts, beans, garbanzo beans (chick peas) and soybeans. Lentils come in a variety of colors. Brown and green are readily available in most supermarkets, while red-orange (some say “pink”) lentils which are more commonly found in Middle Eastern or specialty stores. Lentils, along with other legumes, are used in many dishes, including salads, main dishes, side dishes, chili recipes, dips, spreads, stews and soups. It doesn’t matter what the outside temperature is - hot, cold, or somewhere in between -- there’s nothing more comforting than a bowl of lentil soup. Either of these recipes is sure to please. If you want to jazz them up, toss in some diced carrots or a bunch of fresh, thoroughly washed, spinach leaves cut into ribbons. 1. Sort through lentils and discard any stones, etc. ; rinse. 2. In an 8 qt. pot, combine the lentils, water, bouillon and bulgur. Cook until lentils and bulgur are tender, about 20 minutes. 3. Sauté onions in butter or oil, until softened and lightly golden. 4. Add onion to soup and cook another 10-15 minutes. ** Note: Chicken, beef or vegetable broth can be used in place of the water. In that case, OMIT the bouillon cubes, and add salt to taste. 1. In a 4 to 6 quart pot, combine the lentils, water, bouillon, and rice. 2. Cook until lentils and rice (or bulgur) are tender, about 20 min. 3. Sauté onions in a little butter or olive oil, until softened and lightly golden. Question: do the different color lentils taste different? Are they interchangeable in recipes? The lentils taste pretty much the same. As far as cooking them, the red lentils cook faster and tend to lose their shape. The brown/green lentils take a bit longer to cook and hold their shape which provides more texture to the recipe. 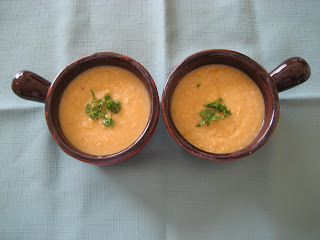 Lentil soup is a favorite comfort food for me and my family. Thank you for the wonderful recipe suggestions! I hope you won't mind that I'm including this comment on February 19th - another posting about for lentil soup- this time for Lent. Rice with the red lentils are best. I also add a small amount of tumeric. The brown lentil I do not put rice or bulgur but at the end of cooking I chop a small amount of parsley and when I eat it and I love to add a few drops of vinegar. Try it next time. Love your suggestions of adding rice to red lentil soup (a good replacement for bulgur), and a bit of vinegar to brown lentil soup. Thanks!